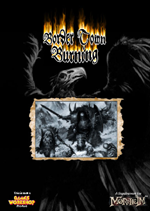 The Border Town Burning supplement features various new hired swords. Some of them are exclusive to BTB campaigns, others can be used in any Mordheim game. The following Hired Swords are available in the Border Town Burning setting. They follow the generic rules for hiring and maintaining Hired Swords from page 147 of the Mordheim rulebook. Any other Hired Swords, either from the Mordheim rulebook, the Empire in Flames supplement or any experimental rules models, can be used in the Northern Wastes setting as well. It is up to the players to agree upon which are likely to be there and which are not � or to include them just for the fun of the game, ignoring background subtleties. Due to their special rules these Dramatis Personae are unique to this setting and should be used only when running a Border Town Burning campaign. The characters described in this chapter are unique and outstanding persons from the Border Town Burning setting. They follow all rules for Dramatis Personae as described in the Mordheim Rulebook on page 152. Some of the special characters described in this chapter can only be hired when using the Border Town Burning campaign system. That is because their hiring and/or upkeep costs are paid using campaign points (CP) instead of or in addition to gold crowns. 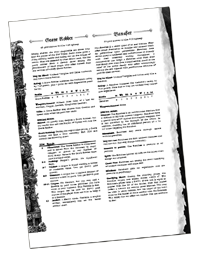 This means, when hiring dramatis personae the warband erases an amount of CP equal to the character�s hiring costs from their roster. The same goes for the upkeep costs which are also paid using campaign points. 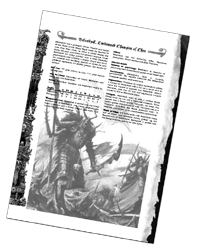 The 'Scion of Chaos' warband objective allows succesfull followers of the Dark Gods to become mighty Daemon Prince Dramatis Personae. 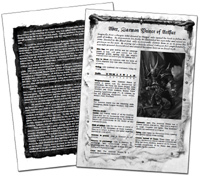 You can find a template for a Daemon Prince character sheet at the back of the Border Town Burning supplement, but if you like, you can send your stats and rules to us and we will format them into a nice downloadable PDF file for you. Note that these characters are not in the Border Town Burning book itself. They are exclusive downloads from the website. Marek Ziolkiewicz's marauder leader won their campaign and reached daemonhood after 25 games. Background and fluff by rev larny, based on Marek's campaign summary.